Just as last night, we had a pleasant conjunction of the crescent moon and Venus tonight, but they appeared much closer to each other. In this photo you can see some detail in the dark part of the moon. This is due to light from Earth (which of course came from the sun) bouncing onto the moon. 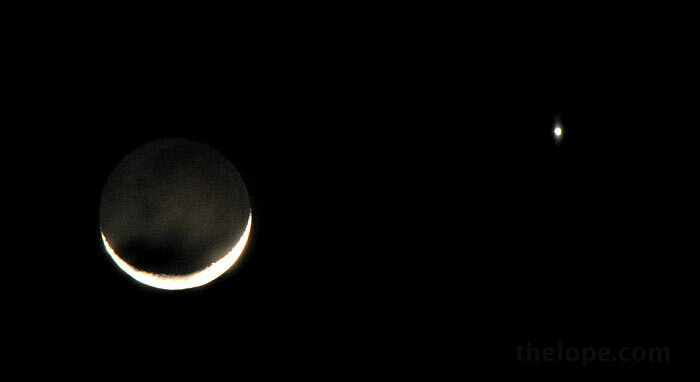 The darker area that sits in the crescent is caused by a thin cloud. This happened even though Venus is in a crescent phase because it is so close to us right now. NASA has a great page explaining this. Conjunctions (celestial objects appearing close together from our viewpoint) of the moon and Venus are not uncommon but this one was more dramatic in that Venus was at its brightest - 20 times brighter than the brightest star in the sky, Sirius.